In California, a handful of lobbyists and lawmakers - working for hire on behalf of the government of Australia and commercial interests in that country - are attempting an end run around the state's legislative process to pass a controversial bill that would allow their patrons to profit from a mass slaughter of kangaroos. The funders of this effort thought they'd get the jump on us in the last days of the legislative session, but HSUS lobbyist Jennifer Fearing has sniffed out their maneuvering, and newspaper editorial writers are crying foul at the plan to make mincemeat of the animal who adorns the logo of Australia's national airline, Qantas. California is the world's largest market for soccer cleats, many of which are made with kangaroo leather. But unless Australia and the soccer-gear sellers get their way, the import of kangaroo skin products into California will once again be banned and shoe manufacturers will have to opt for alternative products, which are abundant and already widely used in athletic footwear. A freshman lawmaker, California assemblyman Mike Gipson of Los Angeles, after being courted by the Aussies, has introduced a bill in a last-minute process known as a "gut and amend" - as a way to sidestep regular order and a deliberative legislative process and to try to sneak in this repeal of a wildlife protection law in the waning days of the 2015 legislative session. This morning, the Sacramento Bee weighed in against this attempt to hoodwink California voters. Gipson, the editorial said, should "not gut the [legislative] process like some hapless marsupial with a marketable hide." Contrary to the propaganda of the industry and the Australian government - with the latter entity funneling $143,000 to lobbyists for this maneuver to keep the kangaroo parts market in California open - the mass slaughter of kangaroos in Australia is neither sustainable nor humane. Commercial shooters kill millions of kangaroos each year in what is the largest land-based commercial slaughter of wildlife in the world. As a very slow-growing and slow-breeding species, kangaroos are at significant risk of local and regional decline if commercial hunting continues at its current pace. In the Australian states of Queensland and Western Australia in particular, population surveys conducted in 2014 show dramatic declines in kangaroo populations of around 50 percent across all areas surveyed. The Australian National Code of Practice advises that hunters shoot kangaroos through the brain to ensure immediate death, but because heads are removed before reaching the processor, there is no accurate confirmation. Low visibility at night often results in kangaroos being shot in their body or neck and left to die slowly and painfully or destroyed, since their pelt has been blemished by the body shot. The killing is almost entirely unmonitored. 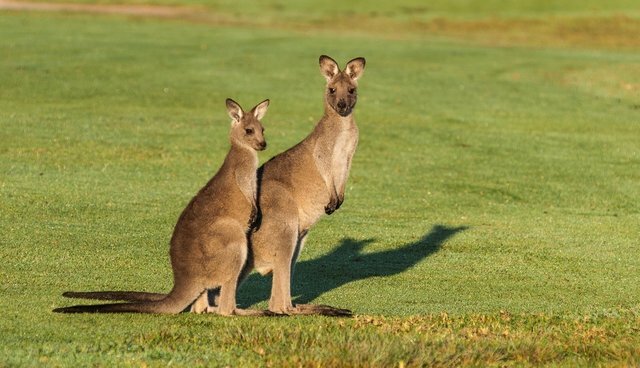 Last week, 70 scientists, academics, and public figures from Australia signed a letter identifying serious conservation, animal welfare, and human health concerns with the slaughter of kangaroos which, they said, is "putting at high risk both kangaroo populations and people's health, and causes profound suffering to the kangaroos, particularly the dependent young." Baby kangaroos, known as joeys, fall victim to the inhumane hunting practices at an alarming rate. When any female kangaroo with a joey in her pouch or nearby is killed, the hunter is advised to bludgeon the joey to death or decapitate it. In 2014, hunters killed more than 130,000 females, resulting in the orphaning and killing of tens of thousands of joeys. In 1970, then California Governor Ronald Reagan banned the trade in kangaroo skin products. The California Supreme Court later unanimously upheld the law. But in 2007 the original California prohibition on the sale of kangaroo products became subject to a three-year exemption after intense lobbying by Adidas, the Australian government, and the kangaroo meat and skin industry. Additional efforts by the industry achieved a second extension on the exemption from the ban in 2010, this time with a five-year sunset clause which ends in 2015. Without legislation this year to extend the exemption or repeal the prohibition, come Jan. 1, 2016, it will once again be illegal to trade in kangaroo products in California. This has led to the last-minute lobbying and now this bill from Gipson. If you live in California, please contact your state lawmakers and tell them to reject this sweetheart deal for a foreign industry and a foreign government. When you have foreign governments at work to influence US policy, there is a special duty for transparency. But maybe even these officials know that once lawmakers and average citizens in the state get a look at the sordid details, they wouldn't much like what they see. That's probably why they are trying this stealth move so late in the game.